Absolutely stunning rejuvenation in the heart of North Chattanooga! 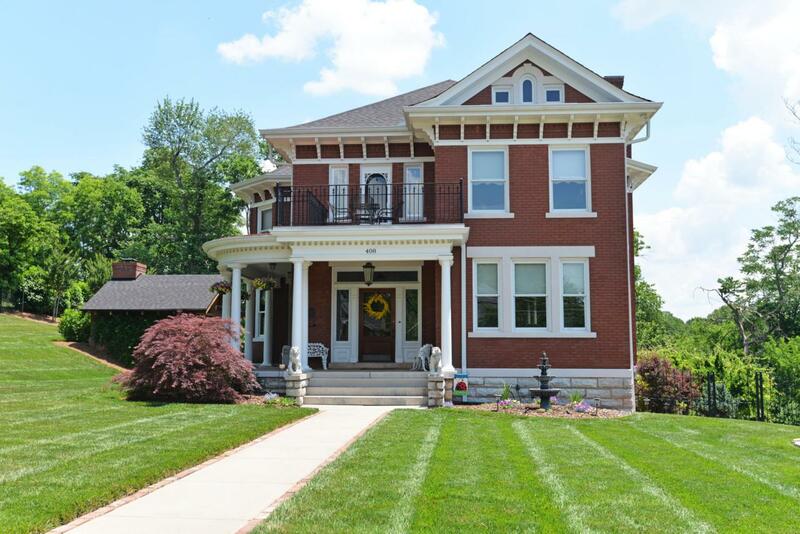 The seller's took great care with their addition and remodel, making sure they retained the original charm of this all brick home built in 1910, while also opening up the living space and upgrading the amenities to modern luxury standards. The large lot allowed for plenty of room for the new 3 bay garage, as well as the in-ground pool and outdoor living spaces, including the cabana with wood burning fireplace that has clear vinyl panels, allowing for comfortable use year round and the covered patio areas with a convenient refreshment center. The lushly landscaped yard has a beautiful wrought iron fence and front walk leading to the wrap around covered front porch. As you enter the home, you will immediately appreciatethe lovely woodwork, including the hardwood floors, moldings and trim, multiple pocket doors and antique mantels. There are 5 fireplaces, 2 of which have been fit with custom gas inserts made to look like the original coal, while 3 remain decorative. Your introduction to the home is a large foyer/receiving room with a handsome staircase and a large opening to the formal dining room to the right which has one of the decorative fireplaces and pocket doors to the kitchen, keeping and breakfast rooms. The keeping room fireplace has a gas insert and has been fitted with a retractable flat screen TV, so you can hide it away when not in use. This area also has a set of pocket doors to the hallway. The kitchen is absolutely gorgeous with custom cabinetry that boasts pull-out and soft-close drawers, a center island with pendent lighting and space for seating, built-in pantry with a re-purposed and refinished door, stainless appliances including a top-of the line gas range with double convection ovens, 6 burners and a griddle, as well as convenient pot-filler. Granite counter tops, subway tile back splash and under-cabinet lighting are the icing on the proverbial cake. There is a main level bedroom that is currently being used as an office and has a walk-in closet, access to the front porch and a fireplace. There is a new full bath in the rear hall off of the kitchen, as well as a powder room just off of the foyer, and this new bath is also perfectly located across from the access to the patio and pool area, the laundry/utility room and just down the steps from the new family room. The family room also has a walk-in closet and access to walk-out storage which could be finished to turn this space into a nice suite and already has a private staircase to the pool area. These spaces are also located above the garage, so plumbing could be run from below if another bathroom was desired. The remainder of the sleeping quarters are also on the second level, including the master suite which has a private sitting room with a balcony overlooking Forest Avenue and the mountains on the horizon. The master also has a decorative fireplace and a beautiful master bath with heated tile floor, separate marble vanities, a large shower with tile and glass surround, water closet and a pocket door with a large walk-in closet with organizer system. There are also 2 additional bedrooms, a hall bath with the original refinished claw-footed tub/shower and pedestal sink and a wonderful screened in porch overlooking the pool and cabana. You will love the built-in cabinetry that was once a display hutch in the original dining room. The new laundry room is spacious enough to also serve as a mud room with built-in cabinetry, a fun antique farm sink and access to the pool area and the steps to the basement where you will find a new hobby or exercise room with access to the original unfinished basement which is perfect for additional storage and the spacious 3 bay garage. A large parking pad at the entry to the new driveway provides additional parking for guests. There is just too much to mention it all here, and you definitely need to see this amazing home for yourself to appreciate the craftsmanship and amenities, plus you simply cannot beat the setting, views and location which is within walking distance of the North Shore and downtown Chattanooga, so please call to schedule your private showing today. Information is deemed reliable but not guaranteed. Buyer to verify any and all information they deem important.